In September 2015, world leaders adopted the seventeen goals of the 2030 Agenda for Sustainable Development at a special United National Summit. 193 UN Member States signed up to the Goals, which are focused around ending poverty and hunger, protecting the planet, fostering peaceful societies and promoting partnerships to help achieve the sustainable development. 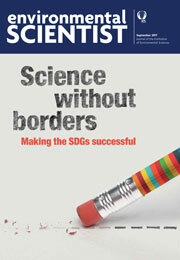 Science is fundamental to many of the Goals and the 169 targets which accompany them, and this issue of the environmental SCIENTIST explores its role, in partnership with policy, business and civil society, in delivering on this ambitious agenda.